Joining a club is a great way to explore your career interests and options and connect with fellow students and professionals in your field. Attend networking events, listen to knowledgeable guest speakers from the professional community, and take part in real-world projects and learning opportunities. If you’re a first-year student, we encourage you to join one or more clubs, to learn more about fields and majors before you choose a concentration. Want to develop your leadership skills? Serve as a club executive board member. Visit Twin Cities accounting firms, listen to guest speakers and participate in community service projects. Attend social events, including the annual spring accounting banquet. The St. Thomas chapter of the AMA is a student-run organization that provides its members the opportunity to network with marketing professionals and fellow students. The AMA is open to all business majors—not just marketing students. BGS is an international honor society limited to AACSB-accredited schools like St. Thomas. Each spring, the top 10% of the junior and senior classes and the top 20% of master’s students are invited to join BGS. Past honorary members include St. Thomas President Julie Sullivan, and Opus alumni and CEO of Feed My Starving Children Mark Crea. Learn about career opportunities and other aspects of legal studies. Business Law Club members are exposed to academic, career, social and service opportunities, and bring the attention of the legal and business world to our campus. First years and sophomores can apply to have a junior or senior mentor. Students accepted into BUMP meet 1:1 with a mentor and attend events. Events focus on professional development and social networking. This international co-ed fraternity trains business and economics majors in professional skills, leadership, ethics, and service. Gain real-world professional experience through networking with alumni, business tours of the Twin Cities and participation in community service. Explore multicultural diversity in the business environment through presentations, activities and collaboration with other clubs. The Diversity in Business Club is a resource for students from diverse backgrounds who plan to pursue business-related careers. This international non-profit organization is active in more than 35 countries around the world, and is open to all majors. Develop community outreach projects that use business and entrepreneurial skills to improve quality of life for people in need. Projects are presented at an annual conference. The E-Society brings in practicing entrepreneurs to speak about their professional experiences, and share advice and inspiration. This club is open to all majors. The Financial Management Association encourages the interaction of business executives, faculty and finance students. Develop your professional, educational and social skills as you prepare for a career in finance, banking or investments. Prepare for success in global business in this fun, informative club. Interact with professionals and peers, and learn through events focused on global business. Learn about careers outside of corporate finance and within the capital and financial markets industry. The club hosts professionals from the investment community and leads educational activities such as managing your own sum of money using a real-time simulator. 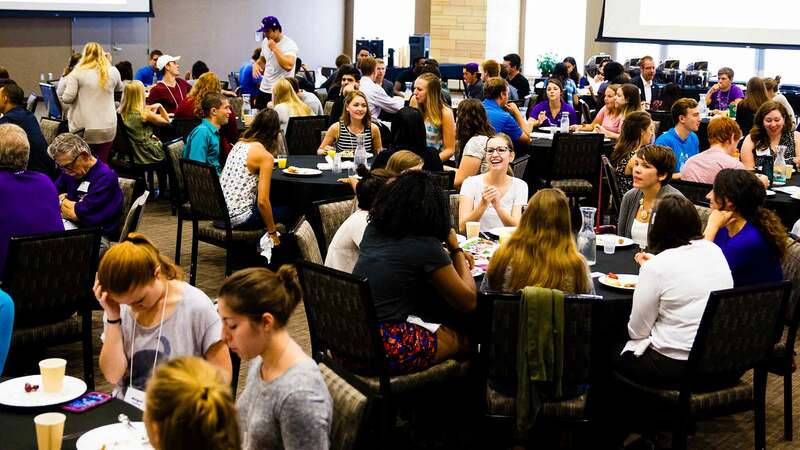 LEAD Club helps bridge the gap between coursework and real-world application. This club regularly interacts with business professionals who discuss specific leadership concepts. Study local markets through club projects, field trips, guest speakers and meetings with industry professionals. Real Estate Society also assists with internship and job placement opportunities with various companies in the industry. Learn about business careers in the world of sports. The club hosts guest speakers who work for a variety of sports teams and organizations, to help students make professional connections and learn about the role of business in sports organizations. In the St. Thomas chapter of SHRM, club members attend monthly meetings to expand their HR knowledge and network with local HR professionals. This tight-knit group regularly participates in social and service events. Network with students and potential employers, and listen to guest speakers who work in supply chain and operations management. SCOM is a student chapter of the American Production & Inventory Control Society, Inc. (APICS), which is a professional organization available for students to join. SCOM is open to all majors. Explore business opportunities, build skills, and connect with fellow business majors through events and happy hours. UBC is the official representative organization for undergraduate business students. The Undergraduate Business Council encourages active participation in college affairs and quality education, providing services in the best interest of the students.